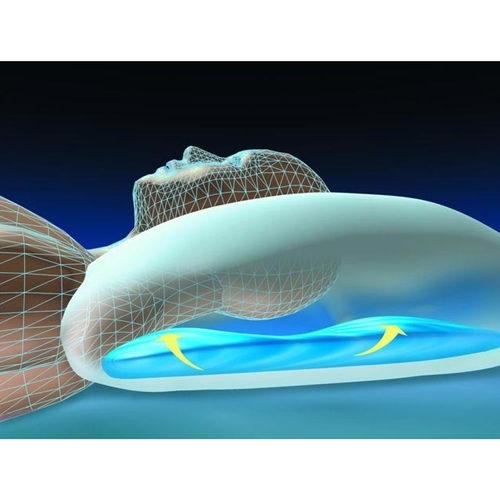 Mediflow Elite Waterbase Pillow from HealthyKin.com is a therapeutic cervical pillow with fillable water bladder. Provides outstanding comfort and support for the head and neck. Instantly adjusts to changes in sleeping position. Reduces neck pain, relieves associated headaches, improves quality of sleep. Thermal insulator fully encases the water layer to prevent body heat from being drawn from the head, neck and shoulders. Super-soft, hypoallergenic DuPont polyester fiber top layer. Fill with tap water. Personalize for soft, medium and firm support. I am still on the fence regarding this pillow. I have been on a life long search for a pillow that is comfortable for my side and back sleep positions. I do not like really fluffy, thick pillows. My head is just not heavy enough to allow me to nestle into a pillow, so I prefer flatter pillows, but need one that will raise my head to be in line with my spine. Hard to find. When I bought this pillow I first slept on it without any water in it because it was already quite fluffy. It was uncomfortable. So, I thought I'd add the water before I gave up on it completely. Once the water was added - per instructions - the air was pushed out and the pillow was much flatter. I used the amount of water suggested for a flatter pillow. I could add more. I liked it the first night I used it like that, but my shoulders were strained. I have tried it a couple more nights with the same shoulder strain. I may need to adjust the amount of water. I am not giving up. This pillow allows for multiple adjustments and I may just have found the perfect pillow for myself, if I can get the fill right! I am a 67 year old female, I have been having severe Arthritis for many years, with severe neck pain at night, since the first night that I used the Waterbase Pillow I have been pain free at night,my husband tried it and had me order one for him too...Thank You, Thank You makers of this wonderful pillow..